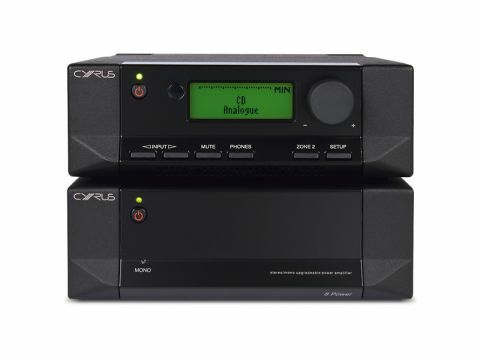 Built, as ever, into the famous Cyrus die-cast chassis, the Pre XP d preamp and 8 Power amp units are picked from among the comprehensive range of pre and power amplifiers in the company's catalogue. To some extent we've chosen an unusual pairing as the preamp significantly exceeds the power amp in price and its usual partner would be the X Power, but apart from anything else, Cyrus offers an upgrade path to take the 8 to X status, so the model chosen initially matters less than usual. In addition, the preamp includes DAC functions so its price can fairly be thought of as including a DAC, as well as an analogue pre. We mentioned upgrades and this is a major attraction of Cyrus. The obvious one for each of these products is the PSX-R power supply, one of which can be connected to each amp for improved resolution and finesse – it won't do anything for output power, though. To that end, you can switch the 8 Power to mono mode and add another for the other channel, increasing power from 60 watts to well over 100 watts. On removing the bottom cover of the Pre XP D, the most notable feature is the amount of unfilled space on the main circuit board. The DAC board is separate and the whole lot is powered by a large toroidal transformer. The 8 Power, of course, has rather more going on inside, its circuit made up mostly of discrete transistors and again powered by a large toroid. Output is on BFA connectors, for which you will need suitably terminated speaker cables or adaptors.